This area first caught the eye of railroad entrepreneurs Henry Gassaway Davis and Stephen Benton Elkins on an excursion with their families in the mid-1880s. Senator Davis realized that a potential fortune in timber and coal lay in central West Virginia, but that could not be extracted without a railroad. The Tygarts Valley near the small community of Leadsville offered a suitable place for the main hub of such a rail line. Davis soon began an extension of the West Virginia Central and Pittsburgh Railway into the heart of the state. Hon. Stephen B Elkins of W. Va. Courtesy of the Library of Congress. Hon. Senator Henry Gassaway Davis of W. Va. Courtesy of the Library of Congress. Elkins was a planned city, laid out from the very beginning as a railroad community. The majority of the downtown, including the old rail yard, is located upon a 163 acre tract bought by Davis from Bernard Hinkle in 1888. By 1889, Davis and Elkins had formally laid out the city, and the autumn of that year marked the arrival of the rail lines. 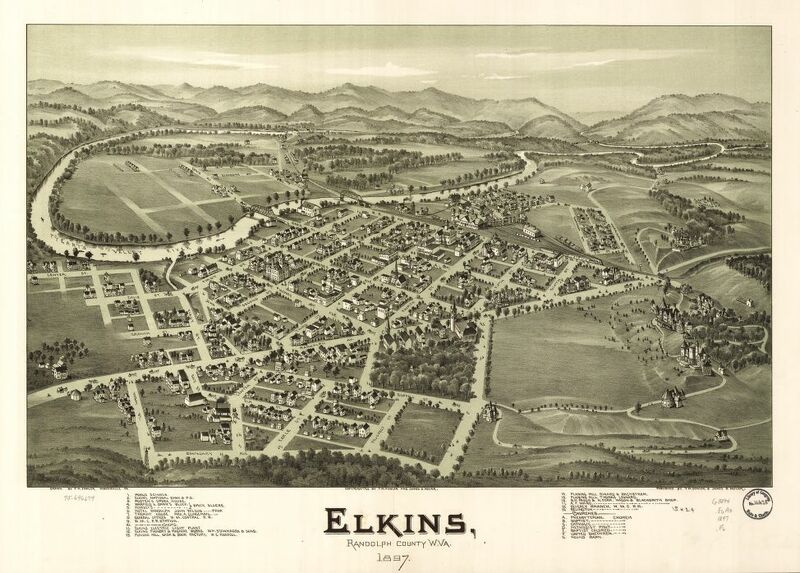 In 1890, less than five years since their first venture into the area, the city of Elkins was incorporated. Development thrived, feeding off the energy and economy of the railroad. The earliest businessmen to show up on the scene were known as the “Eighty-niners,” named for the year they ventured to the newly–founded city. These men built the majority of the early commercial buildings in the downtown area. They were also the first to open businesses and to fill early government offices. Elkins, Randolph County, W.Va. 1897. Drawn by T. M. Fowler. Courtesy of Library of Congress, Geography and Map Division. A devastating fire on March 17, 1897 wiped out most of the original business district. The fire probably started in an upstairs room above the Elkins Furniture & Hardware Store on Davis Avenue and caused losses amounting to some $85,000. This fire forever changed the face of the Elkins downtown district. Building owners learned from the disaster, and rebuilt in brick and stone rather than the wood–frame structures that had been in place before the fire. Most downtown structures today postdate the March 1897 fire. One positive outcome from this fire was the organization of the first fire department in Elkins. The population of the boom town of Elkins grew quickly. Community leaders fought for Elkins to become the county seat, replacing the much older, but now much smaller town of Beverly. After a series of elections, and a near-battle, a court ruling settled the issue in Elkins’ favor, and the seat of county government was moved. Elkins continued to grow over the next few decades and became a center of commerce and culture. 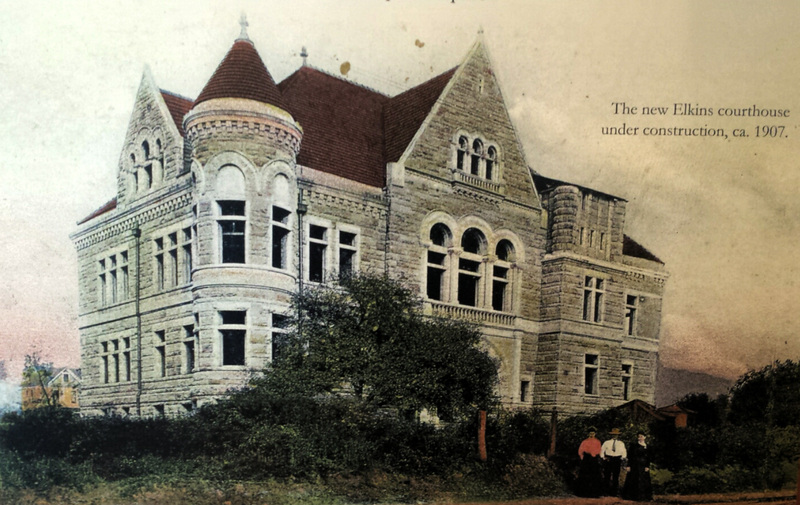 Development was booming, and from 1900 to 1920 – the most prolific construction period of Elkins’ history occurred. Most of the houses and business blocks you see today were built during these years. Workers, managers, and merchants making a living from the railroad established residential and commercial areas in the new town. Shady side of main street, Elkins, West Virginia. Photo by John Vachon, from the Library of Congress. Man in front of grocery store, Elkins, West Virginia. Photo by John Vachon, from the Library of Congress. Men sitting on steps of hotel, Elkins, West Virginia. Photo by John Vachon, from the Library of Congress. Elkins, West Virginia. Photo by John Vachon, from the Library of Congress. To this day, Elkins continues to shine as the business and cultural hub of Randolph County. When the mainline railroad moved out, community leaders moved forward to rebuild the rail yard and downtown economy based on tourism and small businesses. While the purposes of some buildings have changed, walking through downtown will still give you a glimpse of what life used to be like in this industrial city, and how over 100 years later, social, cultural, and commercial scenes are alive and thriving in a new age. A modern view of Davis Avenue, which runs through downtown Elkins. An overview of Elkins and D&E College. The Old Brick Playhouse, Artists at Work, and further down make up the segment of Davis Avenue between 3rd and 4th Street.